Earlier this week I read a tweet by @CeciELT on a what seemed to be another Twitter / blog challenge. Well, as Cecilia said she was “In”, I decided to check the link and see what this was all about (you see, if Cecilia says something’s good, then it’s good!). So off I went hyperlink chasing to read Tara’s post on Tyson´s blog. But the thing is, the minute I began reading Tara’s post and understood her challenge I thought, yes, I’m also “in” on this one. I have in the past posted a few, but very few, #FF tweets. I worried about being repetitive in my mentions as many of the names I wanted to tweet about had already been tweeted about. I’ve been completely surprised when I’ve received any #FF mentions as I consider my tweeting to be much more a RT process (excepting my #breltchat participation and my eventual #eltchat participation). I also had the impression at times that the #FF mentions had sort of lost their impact on me. Yet, without a shadow of doubt, it was through the #FF and #TT mentions that I’d actually built up my Twitter PLN and had actually chanced upon some fantastic bloggers. So, Tara´s task made a lot of sense: to select a blog post from a fellow ELT blogger, someone who I could pay a #FF tribute to, explaining why this blogger and their specific post were important to me. One of the first blogs I began following on a regular basis back in my early days of tweeting (I began in early 2009) was Henrick Oprea’s blog: Doing some thinking. I liked the manner in which Henrick addressed the issues he chose to blog about; I enjoyed the fact that he often added a spin to his posts which made it relevant to the ELT community in general but also touched on points which were specifically related to our ELT reality here in Brazil. Although I had started blogging a few years back, using another blogging tool, it was largely due to seeing Henrick gradually build up his blog that I decided to start my own ELT blog using WordPress in January 2010. Seeing the myriad of bloggers who were already around then I wondered whether there was room for one more blogger. But by accompanying Henrick’s posts I became convinced that it is the sum of the parts that actually helps create a real learning/teaching community. 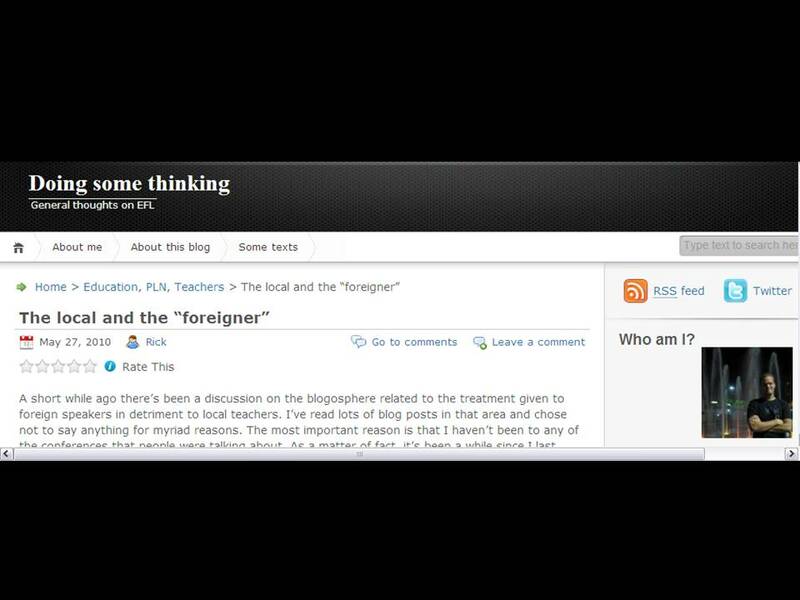 It was Henrick’s post “The local and the foreigner” which motivated me for the first time to respond to a blog post. It showed me that by commenting on a blog post, reading other colleagues’ comments and the blogger´s own follow-up comments I could be part of a challenging and complex weave of online dialogic interaction. In fact, this has been one of the most important learning experiences I’ve had using social media – the potential for growth as a reflective practitioner is simply immense. So, if you’re looking for a good ELT professional to follow on Twitter and want to read really pedagogically sound posts, please follow my #FF suggestion: @hoprea. ← Are you a first-time Young Learner teacher? I’d like to both thank you and apologise. I’d like to thank you for such a nice post about one of my posts, and apologise for taking so long to finally having the time to pay it a proper visit (had read it on my iPod touch and only sent you a tweet) and leave a proper comment. At this very moment, as we’re putting together our regional conference in Brasília, we can see it first-hand how hard it is for us to engage people to come when they expect to see a VIP name – little do we know how many good people we have around us that could much more easily help us learn and grow. As you said, Brazilians tend to be very sociable, but I totally agree with you that we are not as friendly as we once were. Another thing that’s called my attention, in our world of ELT, was learning about how strong some rivalries can get in some parts of the country between schools. In Brasília, in particular, I don’t think this is as apparent as I’ve heard it is in other cities, but still… At least I’ve been fortunate enough so as to have the chance to work together with you, Cecília, Bruno and Raquel on #breltchat – a great example that if we work together we can accomplish great things regardless of where we work. Finally, I’d like to say how high I think of you, and that even though you say you “have been wondering why I keep saying I have a blog as I’ve really not had enough time to post anything new recently”, I am yet to find a post on your blog that hasn’t made me think and that is not worth sharing. I’ve recently read that people should only blog when they know they’ve got interesting things to say. In your case, I’m sure you’ve got lots of interesting things to say, you just need the time to do so. In the meantime, I’m just happy to know I can share a bit with you on #breltchat and read your occasional, yet solid, blog posts. Thank you for finding this post and giving us all a reminder of why Henrick is a great follow! Thank you so much for taking the #FF challenge. I often wonder if some of the bloggers out there know how much the community appreciates their posts. @hoprea’s blog is full of goodies, and this #hiddengem one is one of them. It offers a nice reminder about life in general. In fact. In Canada, we often don’t even know our neighbours names. You’ve given me a lot to think about. Thank you! After 2 years in my current condo, I haven’t gotten past the awkward ‘hi’ with neighbours who get off on the same floor as me. Haha. Yes, there is a huge cultural difference between what you both describe and the way we conduct our social interaction here in Brazil. Although I think Brazilians are getting a bit less “friendly” than they used to be, it´s very difficult for us not to speak to neighbours. In fact, it´s quite easy to start up a conversation on public transport with the person you´re sitting next to who you´ve probably never met before. This does have it´s drawbacks though: neighbours can be very nosey at times, and I tend to think people ask too many questions and make overly personal comments. But then again, I was brought up much of my life in the UK. I may have aquired a degree of reserve which is not so common amongst Brazilians. In fact, when I returned to Brazil in my early twenties I had to make a conserted effort to be more approacheable otherwise people mistook me for being a bit snobbish…funny that!